A wonderful combination of history, scenery and whisky! Our Speyside whisky and history tour begins from Inverness with a visit to the Bronze Age Clava Cairns and Standing Stones. Dating back over 4000 years, this grouping of burial cairns, rings and standing stones gives us a fascinating glimpse of the very ancient past of the Scottish Highlands. 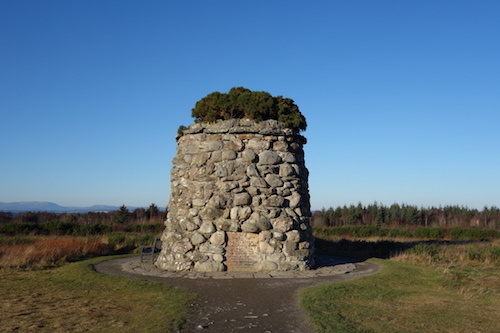 Only a short distance from Clava Cairns is Culloden Battlefield where you explore the dramatic history of the Highland clans, Charles Edward Stuart (Bonnie Prince Charlie) and the Jacobite uprisings. The excellent interactive visitors centre sets the scene of this decisive battle and the Jacobite story before you embark on a poignant walk through Culloden field to the clan grave markers (including such famous clans as the Frasers, Macdonalds, Mackintoshes and Camerons). After an early lunch at the battlefield cafe, we head east towards the grounds of Brodie Castle, home of the wonderful Rodney Pictish Stone. This class II Pictish stone (8-9th century, highly decorated stones with Pictish symbols and Christian imagery) includes a very striking Pictish beast illustration. The afternoon takes us to a local 'hidden gem', the Benromach Speyside whisky distillery where you enjoy a tutored tasting (no tour) of up to three Benromach malts. We then continue further into Speyside for a late afternoon visit to Glenlivet where you take a distillery tour that includes a dram from a cask in the warehouse followed by two more tastings in their dramming room. This beautifully kept medieval castle, built around a 15th century tower house keep, is rich in Highland history. It also has wonderful gardens to explore after visiting the castle. Should you prefer we can visit either Glenfiddich (£10pp distillery tour) or Macallan (£15pp distillery tour) for our afternoon distillery tour instead of Glenlivet. Should you prefer just to have a guided walk of Culloden Battlefield and not visit the exhibition centre we would have time to have a late lunch stop at Glenfiddich distillery in the Malt Barn cafe where you can also enjoy whisky tastings. This option can also work with Cawdor Castle by reducing the time for visting the gardens. Tours are exclusively for your private group only (up to 3 persons) and prices are per tour. We only offer private tours and do not combine individuals or separate groups - if your group size is less than 3 the advertised tour price still applies. Prices include all taxes and a driver/guide but exclude distillery tour and tasting fees (listed above), historical attraction entrance fees (Culloden Battlefield Visitors Centre Exhibition - £11 pp) and meals. There are no entrance fees at Clava Cairns or Rodney Pictish Stone.